The brethren of Old Crosbeian Lodge No 4992, along with their many guests, met at Merchant Taylors’ School, where each meeting of Old Crosbeian is held. The school’s music room is converted into the lodge room and on this occasion saw the installation ceremony of Ian Elsby becoming their new WM. Barry Dickinson (left) congratulating Ian Elsby on becoming WM. 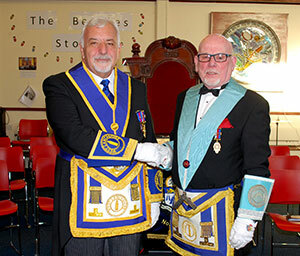 The lodge was honoured by the presence of the Provincial Junior Grand Warden Barry Dickinson as their principal guest and as the representative of the Provincial Grand Master Tony Harrison. Barry was accompanied by Ormskirk and Bootle Group Chairman Graham Chambers, vice chairman Malcolm Alexander, together with grand officers and acting Provincial grand officers. The installation ceremony commenced with the acting and installing WM Chris Taylor, welcoming the brethren to the ceremony, before opening the lodge. After the usual lodge business had been completed, the DC Paul Grainger, announced that Barry Dickinson was without and sought admission. Barry was then admitted into the temple in a magnificent possession, accompanied by group officers, grand officers, Peter Levick, Paul Shepherd, John James, Jeremey Gaskell, Keith Griffiths and acting Provincial grand officer Rick Walker. Chris then asked Ian Walton to occupy the chair of SW, Peter Ware to remain as JW and Ian Donaldson to remain in the position of inner guard. Ian was then presented by the presenting officer Stewart Potter and after he had taken his obligation, Chris installed him into the chair of King Solomon according to ancient custom in an exemplary and faultless ceremony. The working tools for the third gegree was presented by Jonathan Durkin, the second degree tools by David Cairns and the first degree tools by Paul Grainger, the presentation of all three degrees were presented in an excellent and proficient manner. During the investiture of the lodge’s officers, the address to the almoner was delivered by Derek Midgley, the address to the deacons was delivered by Paul Grainger, the address to the inner guard was delivered by Ian Donaldson, the address to the stewards was delivered by Chris Taylor and the address to the tyler was delivered by Peter Ware. These where followed by the address to the WM, which was given by Ian Walton, followed by the address to the wardens by Robert Beaver and the address to the brethren of the lodge by Barry Dickinson. With the ceremony being completed, Barry brought the congratulations to Ian on behalf of the Provincial Grand Master Tony Harrison. Barry then thanked and congratulated Chris for the excellent ceremony he had performed and all the brethren who had taken part in the evening’s ceremony. With the ceremony coming to an end, Ian closed the lodge in prayer and harmony, with the brethren making their way across the school’s courtyard to dine in the magnificent splendour of the school’s library for a delightful festive board. Barry Dickinson and Ian Elsby (centre), with grand and acting Provincial grand officers.